I’ve always loved the news but never dreamed I’d one day graduate college and work in the journalism field. My journey began when I enrolled at the University of Montana in the fall of 2007, after escaping a North Dakota nursing home. School was intimidating at first because I was 32 and didn’t know if I could handle the rigors of college. I use a ventilator full-time and had concerns about how my respiratory health would cope with many long days. However, it wasn’t long before I got into a comfortable academic routine. 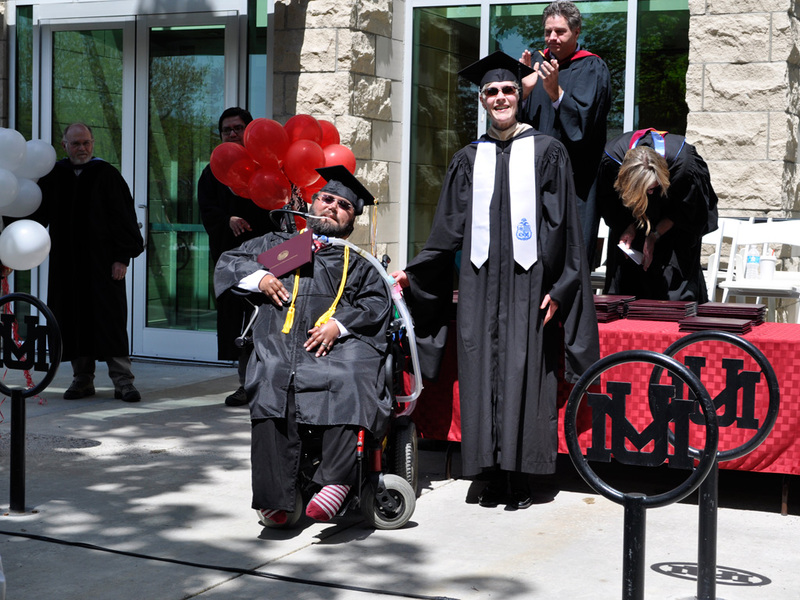 Disability Student Services through the university was a tremendous help in providing support and accommodations. They transferred all my textbooks into a PDF format, so I could read them on my computer. Another big help was being allowed double time to complete my exams and the ability to use my laptop computer to type out essay questions. These accommodations leveled the playing field and helped lay the groundwork for my success. My goal was to enroll in the journalism program but I had to complete two years of prerequisites before I could apply. It seemed like forever but I tackled each class with maximum effort, knowing what lay ahead. In the spring of 2010, I was ready to apply to the journalism school with a 3.7 GPA. Anxiety ran high for all of us who were applying and the wait was excruciating. Although I was confident, I didn’t want to set myself up for disappointment. The letter finally arrived and my heart was thumping like it wanted out of my chest. I had my nurse tear open the letter and all I remember is seeing the word congratulations at the top. Excitement overtook me and I could hardly believe I would be entering the University of Montana School of Journalism in the fall. I was nervous too but I was going to make the most of this opportunity. That summer I enrolled in a broadcast production class where I learned how to shoot video, edit and produce my own stories. I didn’t know how I would operate a news camera but thankfully my professor was an inventive guy who wanted me to fully participate. The downside was that this class would finish in only six weeks. Things moved fast and we covered every aspect of production including how to adjust the camera settings, how to monitor audio, how to set up lighting for interviews and how to shoot many different angles. Editing would come last but first the hard work had to be done. I chose the stories I wanted to cover and my professor volunteered to be my production assistant. I’d have to direct the entire process but he was there for technical assistance. My professor was also a television producer and he let me borrow some of his professional gear. Looking into the viewfinder was hard but my professor had an auxiliary LCD screen that could be used as a viewfinder. This helped me check my production quality and how each shot was set up. My main story to cover was a campus renovation project and my professor was there to assist me every step of the way. Once the video had been shot, we went into the computer lab and edit everything together with Final Cut Pro. It was easy once I got the hang of it and I was able to use the computer with my Smart Nav mouse. The experience was challenging but I ended up with a great video piece and an A in the class. That fall I enrolled in my first journalism classes and the most time-consuming one was my online news class. We spent the whole semester collaborating with a regional online publication and doing a multimedia series on food issues in the Rocky Mountain West. I did my story on the decline of agriculture in Montana and Colorado. I was responsible for doing all my own interviews and this was made easy by my digital voice recorder. It took a tremendous amount of work but when it was finished, I had my first professionally published article. The professor was excellent and he held me to the same high expectations as the rest of the class. This was important because I wasn’t going to take any shortcuts. Spring 2011, would usher in the toughest semester I would face. I took a public affairs reporting class, media law and print/web design. My reporting class was extremely intense and we had to cover weekly city council meetings in addition to our other stories. I was really worried about covering a 7 PM council meeting and having a full story in by a midnight deadline. It was a mad scramble after each meeting and it was journalism at a breakneck pace. There were many close calls but I didn’t miss one deadline. I learned so much in that difficult class and felt confident with whatever I would face in my academic and professional career. My print/web design class taught me everything about creating various types of digital media in a journalism environment. The professor was tough as nails but he was very fair. Deadlines were fast and furious but he gave excellent guidance through every project. The highlight was designing my own magazine and newspaper layout. I sweated bullets many times in this class but I developed a great professional relationship with the professor. He was difficult but the expectations he had were ones that we’d face in the working world. The first year of the program was now complete but I would now spend the summer completing my internship at the newspaper here in Missoula. I was a summer reporter working under the city editor and other staff reporters. My job was covering a wide variety of local stories and submitting them by a 5 PM deadline. It was very interesting work and it was the first time I had worked in a large newsroom. Most of my time was spent working the phones and I had a fellow reporter who helped me rig a way to record my phone calls. The most difficult part was the time involved quickly transcribing my interviews. There were many stories I did but the one that sticks out was a gentleman who wanted a mountain peak name for his father, who worked for many years as a park ranger in Glacier National Park. The process of naming a national site for somebody is intricate and it was fascinating to write about. I started reporting on the story with just the name and phone number of his son. It was great to see the story unfold and develop. It was one of many great internship experiences and it gave me valuable experience in seeing how the news should be covered. My second year of journalism school was more laid-back. A freelance reporter who had worked extensively in Southeast Asia taught the most interesting class. The class was all about the ins and outs of freelance journalism and how we could become self-employed after graduation. It was valuable information and it’s helped me in my early career. During my final semester, I took a feature writing class where I learned how to write longer and more descriptive stories. We had to pitch story ideas to our professor, who served as our editor. It was very difficult because we were required to cover original stories that dealt with life between sundown and sunrise. The work was difficult because it required many late nights and coordinating nurses for that was stressful. I spent my nights covering stories on an area rancher during calving season, the local emergency veterinarian clinic, a nighttime tai chi class and concerns about pollution from coal trains. I’ve never been so happy to finish a class but I was so glad that I took on another challenge that most able-bodied students chose not to do. My two years in the journalism school were now coming to a close and graduation was on the horizon. It was hard to leave behind so many great friends and professors but it was time for the next challenge. Saturday, May 12, 2012 was graduation day and I was fortunate to have my family from North Dakota in attendance to help me celebrate this incredible day. As I filed into the football stadium, I thought about all the people who had loved and supported me over the years. I was beaming with pride and couldn’t believe that my goal had been realized. The highlight was getting my diploma from the Dean of the journalism school and being recognized for all that I had accomplished. It was a magical day that I’ll never forget as long as I live. I had wondered about what career path I would take but the answer came during graduation weekend. New Mobility magazine is dedicated to the active lives of wheelchair users and they were looking for a new news writer. I’d been very familiar with the publication but wondered what my chances were for landing my first job. One of the others at the magazine wanted to hire me after reading my stories and I couldn’t believe my good fortune. I started my job with the magazine in July and it’s been wonderful. Each month it’s my responsibility to cover various stories of interest to our readership. Finding fresh news that’s interesting is difficult at times but at the end of the day it’s very rewarding. Getting paid for writing was always my goal and now it was really happening. They have had me write many features for the magazine. My favorite was writing about the experiences of people with disabilities during Hurricane Sandy. It was such an eye-opener to hear stories about the lack of disaster response from the government and how some people fought for their very lives. Covering a story of this magnitude is what journalism is all about to me and it’s a mission I take quite seriously. The past five years have been an incredible ride and I learned that reaching for one’s dreams is possible no matter the odds. Many people with disabilities have come before me and accomplished great things but it thrills me to see others pursuing college right now. There’s no secret to my story but I will say that it took a tremendous amount of drive and hard work. Anything is possible. You just need to commit yourself to what you want to do in life and never let go, no matter what anybody tells you. This is such an inspiring story. Congratulations, Mark, for making your dream a reality. You never let your challenges beat you. God Bless.